Or submit form below, and mail your payment or drop off your payment with Tracy Ekeren, address below. 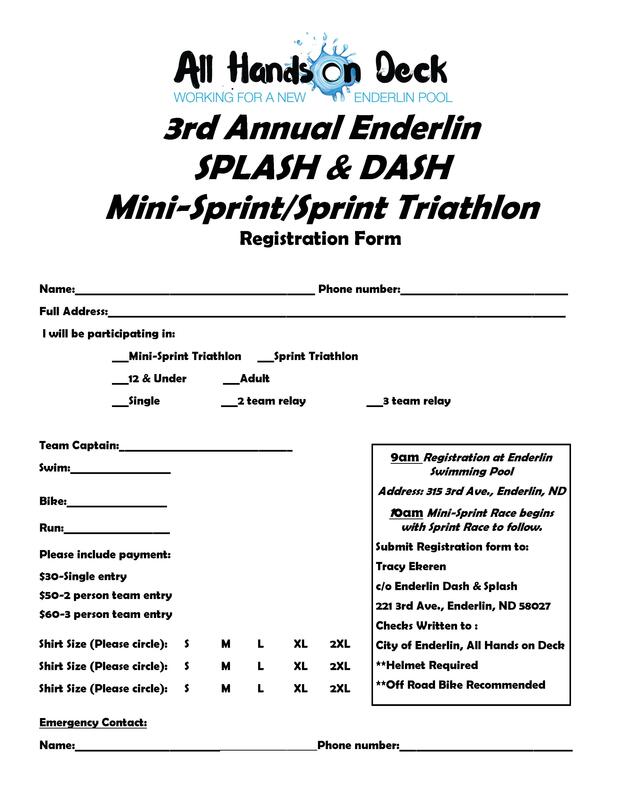 3rd Annual Enderlin Dash & Splash Mini-Triathlon - July 13th 2019! Join us on July 13th, 2019 at the Enderlin Swimming Pool for our 3rd Annual Mini-Sprint-Triathlon! Pre-register by July 1st to guarantee a shirt. This event is a fundraiser for the All Hands on Deck, Working for a new Enderlin Pool. Great Volunteers with Enthusiastic Participant Carter! Way to go Carter and Dr. Doug! Mark & Jess Olson 2nd place in their division, well done! Adam Gietzen, David Bjorklund & Father Chris Markman great 2nd place finish!